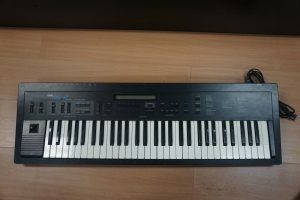 “Used Korg DS-8. Some superficial scratches, but nothing major. All keys, buttons and functions working as they should. “Korg DS-8 mostly working, for parts or repair. Mostly refurbished and cleaned by me. I was able to apply the factory reset and it plays sound, and the memory held. Can not load new sounds as it needs some of the push button micro switch contacts that are under the buttons replaced. Lots of how to do this on youtube. Quick solder job. 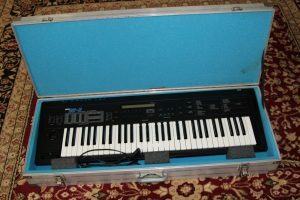 “Korg DS-8 Synthesizer Keyboard with Soft Case. Has some wear marks on bottom of screen. “This Vintage KORG DS-8 Digital Synthesizer Keyboard is up for auction. “Good used condition, with some scuffs and scratches from normal use. Some dust/minor staining on keys. The F# key above middle C is askew and is rubbing on the F key, making them both sluggish on the rebound. Tested and working well. No power cord included. “Powers on but no sound..Also 7 to 8 keys are stiff, Screen lights up and seems to be ok but does not produce sound..
Sold for Repair with No Returns..